Perle Noire the Black Pearl. “I saw her performance on a video, and I immediately wanted to have her be a part of the show.” – Dita Von Teese, on her first impression of Perle Noire. 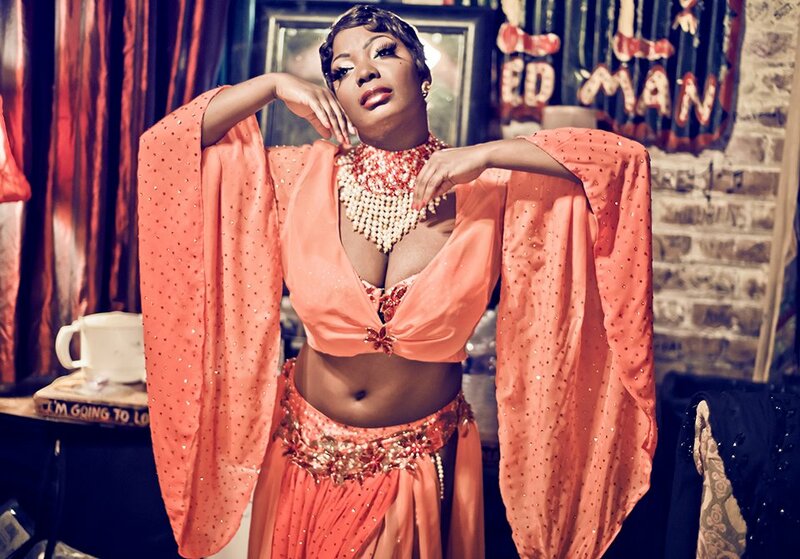 Paul O’Connell and I caught up with New Orleans-based performer Perle Noire just as the first few dates of Dita’s Burlesque: Strip Strip Hooray! variety show were kicking off in sunny California. While on the road, Perle took a little time to reflect on the whirlwind adventure that burlesque has taken her on- which seems to be a commonality between all the Strip Strip Hooray performers, including Dita herself (that interview will appear on BSP and in Seattle Gay News this Friday). Burlesque has been an incredible, electrifying wave that Perle- like many performers- never imagined she would be carried away on. Perle’s exuberant, impassioned style and boundless energy have taken her far- and it looks to us like she’s just getting started. Perle is a revelation on stage, and we can hardly wait to see her perform with Strip Strip Hooray in Seattle and Portland. BSP: Hi Perle! So you’ve worked with Charlotte Treuse on a few costumes now- how did you meet and end up collaborating? Perle Noire: I met Charlotte in New Orleans. 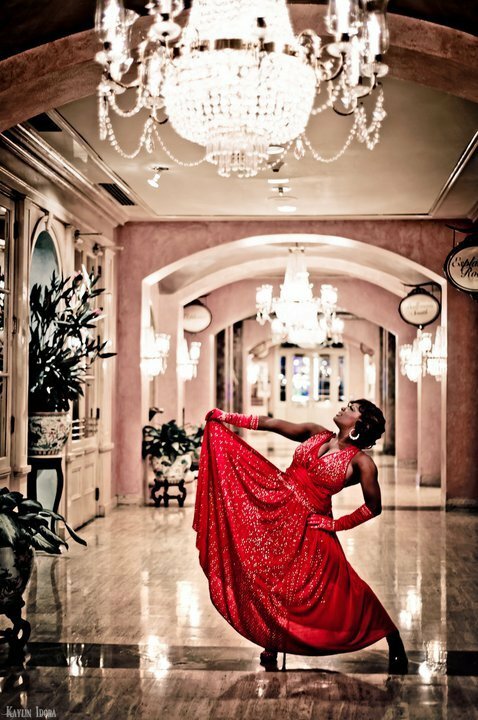 She was performing with The Travel Channel’s Top Burlesque show pick Bustout Burlesque. We had an instant connection. I invited her to my home for a party. My good friend and famous photographer Kaylin Idora told me that Charlotte was an amazing costume designer. And the rest is herstory. My costume is so pretty. My act is inspired by the African Goddess, Oshun. Charlotte made a beautiful flame cape and classic panel skirt inspired costume. Everyone should hire her! BSP: How did you end up in New Orleans from Dallas? Perle: I moved to New Orleans by accident. My high school sweetheart and I decided to date again, and I didn’t move back home. Our relationship didn’t last but I started on my journey to becoming a full time burlesque artist. BSP: What were your feelings about being named Queen of Burlesque at the first New Orleans Burlesque Festival? Perle: I was in shock. I didn’t expect to win. I just wanted to dance and prove to myself that I could turn out a good routine. I performed a few months before and the performance was a disaster. I performed with all of my heart and soul that night. It was a truly amazing night. Perle: *Blushing*. I have to stretch for about two or three hours before a show. I’m in such pain if I forget. My energy comes from love and passion. Dancing and the stage have always been there for me. I had an interesting childhood. It was rough. The only nice thing people said about me was that I was a great performer. I’ve always used the stage to escape my reality. The stage is the only thing that never let me down. BSP: Have you ever lost a pastie or other costume bits during your gyrations? Perle: Losing a pastie is my middle name. The crowd loves it but I always feel bad for the producer or venue. Every venue or city has different laws and I don’t want anyone to get in trouble. BSP: You have a very unique chemistry with the live bands you’ve worked with- most notably The Bustout Burlesque Jazz Band, in your role as a one of the stars of Bustout Burlesque. You seem to connect with music deeply and it adds a very primal dimension to your burlesque- it feels like real, no-bones-about-it striptease. Do you prefer working with live bands to using pre-recorded music? Perle: I really enjoy working with a band. It feels free and genuine. I love feeding off the band’s energy and creating a moment that isn’t planned. Of course, a show takes a lot of hard work and planning, but I feel that the most memorable moments aren’t planned. It’s such a wonderful high. BSP: Do you envision the act first, and let it mold itself to the music? Or is it the other way around? Perle: I envision the act, and it can take 2- 12 months to find the right song. I have to find the perfect audio recording and a great live version. Then I try out different versions of the choreography. It’s a very long process. Perle: Dita told me that she asked her fans who she should feature in her New Orleans show and most of her fans suggested that she check out my youtube videos. She said that when she saw my videos she knew immediately that she wanted to work with me. I feel so lucky. I know she could pick any burlesque dancer in the world. BSP: How did you get started in burlesque? Perle: I started doing burlesque in 2003. I was featured in a burlesque musical called “Backstage at Da Fonky B”, a Burlesque Musical. The show went on tour and it was an amazing experience. I performed in New Orleans, NYC, and at the Montreal Fringe Fest. After that I started to perform with Bustout Burlesque. And look at me now- I’m on tour with Dita Von Teese. If I’m dreaming, please don’t wake me. BSP: What have been some of your own performance highlights and/or most memorable ones for you? Performing with every Burlesque Queen in the world including Dita Von Teese. BSP: What are your thoughts on the future of burlesque? Perle: I pray that burlesque will continue to inspire people. Burlesque is one of the oldest forms of theater. I hope people and artists remember that. Burlesque saved my life and I pray that the art form will continue to evolve. And in a mind-blowing display of physicality and pure FUN, check out “Perle Noire, the Black Pearl vs. The Sourpuss”- (don’t miss the final two minutes, whatever you do). Visit Perle Noire the Black Pearl at: www.perlenoireburlesque.biz, and get tickets for Seattle’s Burlesque: Strip Strip Hooray! shows HERE. For tickets to Strip Strip Hooray! in other cities, click HERE. ~ by angrytruffle on 05/15/2012. Tags: Bustout Burlesque, Charlotte Treuse, Dita Von Teese, Perle Noire, Strip Strip Hooray!